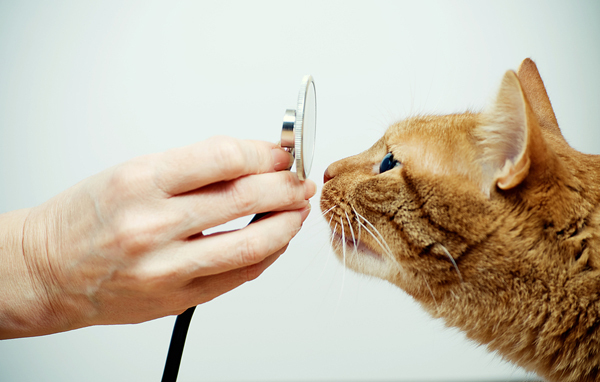 Taking your cat to the vets can be a very stressful experience for both you and your cat. I used to find it really distressing and since MellyBoy needs regular trips to the vets for his tablets and check-ups, it was something we both needed to get a handle on so I wanted to share some words of advice with you. The first thing to remember are cats are territorial which means they form attachments to a familiar environment and items within it. I found that hiding the cat box away in a hidden part of the house and then producing on “vet day” was a recipe for disaster. MellyBoy would take one look at it and rush off outside or under furniture. It was then really hard to catch him and he would become aggressive (flight or fight). Now, I leave the box out all the time… it is open and he can pop into it when he feels like it. Plus, since he walks past it and rubs around it, it does not have an unfamiliar smell. I also occasionally pop one of his cat nip toys in there which encourages him to step inside and become accustomed to the feel of it. 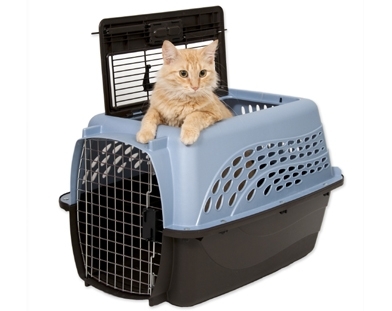 The next step was for me to learn how to safely and calmly put him into the cat carrier. My wonderful vet demonstrated a scruffing technique which worked well, but now we have a routine that we are both comfortable with, I can pick MellyBoy up and pop him in his carrier fairly easily. Having a box with a top opening makes the whole thing a lot easier. I always pop an old towel in the bottom of the carrier as MellyBoy will always pee as soon as he goes in the box…. I assume this is fear bless him. OK so I have caught him and popped him in the carrier, so what next? I spray a towel with Feliway and drape it over the box before popping it in the car. You can read more about Feliway here. I pop the carrier on the passenger seat and secure it with the seat belt. Some people use the passenger foot well but I find MellyBoy stays calmer if he can see me. I always have the radio on low (he is used to the constant sound of music at home) and I make sure that I book non-emergency appointments outside of rush hour so we don’t have to be in the car too long. Luckily, MellyBoys vet is only 5 minutes’ drive from the house. I tend to talk to him the whole way but then I am a crazy cat lady and talk to him at home all the time too! Nearly there… so what happens at the vets? The fab veterinary surgery I take MellyBoy to has a couple of cats that live on site and they are very friendly and curious and like to welcome newcomers. However, my boy is not in the mood for socialising so I always put him on the chair next to me and face him away from the room so that he feels secure. After his appointment I get him back home as quickly as possible and as soon as I have opened the basket he races off and frantically washes himself. This is often a sign of stress (almost like self-comforting) so I leave him alone for a little while and then offer him some tasty food. By the time he has snacked on a little bit of tuna the whole thing has been forgotten! Obviously, this would be different after some major treatment or surgery so I would always recommend checking with your vet about after care. MellyBoy happily relaxing on a non "vet-day"